We’ve taken inspiration from some of the best practice we’ve seen in independent schools to create this guide for teachers and heads of department who want to get more recognition for the visual arts in their schools. Much emphasis is placed on more traditional academic subjects in schools, meaning that the lasting benefits of visual arts provision often gets overlooked. But whilst it is important to get the message across to pupils, parents and staff, advocacy alone isn’t enough - you need to be seen as well as heard. 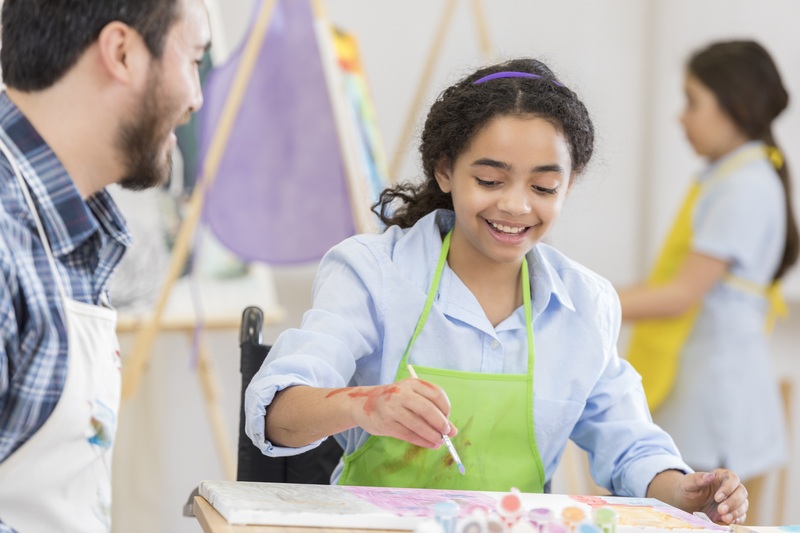 If you want people in your school community to sit up and take notice, then you’ll need to take practical steps to put the visual arts on the map, and this guide is full of ideas for how you can start. It may sound obvious, but the more work you display outside your department, the more visible your department will be. Increasing visibility of the huge range of styles and talents of the young people in your school will only increase the prominence of your department. Often this is something which visitors will pick up on instantly when they step foot into the school, setting the tone for their whole visit. If you really want to make a splash, then why not start with the biggest canvas you have at your fingertips: your school building? Students’ artwork should not just be displayed in the art department, but throughout the school. Of course, you can’t expect other departments to give you all of their wall space, but you could offer to provide some colourful artwork to help enhance classroom, assembly hall or corridor displays. Why not approach your colleagues, offering them the opportunity to commission some of your most talented students to create a display around a theme that fits their subject? Or think beyond subject areas and approach the library or chapel for a special commission - especially if these areas of your school are of particular architectural or historic interest and therefore on the tour-route for visitors. And if there are digital display screens around the school building, then use these to display students’ photography work, or photographs of students’ artwork. Keep the visual arts front of mind for staff and students by displaying work in communal areas like the refectory, staff room, reception area and the headteacher’s office. Again, you could offer special commissions for any members of staff who would like a distinctive piece of art for their office or department. You could even invite your headteacher to sit for a portrait, or create a sculpture or bust to commemorate a past head or patron. Holding a regular exhibition of work gives students something to work towards - especially if you have some specific criteria that must be met for work to be included in the exhibition. Music and Drama have concerts and shows which take months of rehearsals leading up to a high quality performance - an exhibition should be equally polished. Make a real occasion of the event - hold a drinks reception, and invite the music department to provide some live performers. As well as staff and parents, why not invite a local artist to judge the best pieces in the exhibition and award a prize? Or you could hold an auction and donate the proceeds to charity. You could assign a team of sixth form students to run your termly or annual exhibition. From promotion and operations to stewarding and curation, there are a wealth of opportunities for students to develop their events management skills - a leadership opportunity which could be counted as part of a Silver or Gold Arts Award qualification. If you don’t yet have a permanent gallery space for your school, then his could become a visual arts project in itself - why not take a dis-used outbuilding or basement area and transform the space into a gallery? Your schools’ social media feeds are the perfect platform to promote the visual arts and get more visibility beyond the school gates. You could set up a dedicated Instagram feed for the visual arts, or use the whole school account - whatever works best for your school. Using these platforms to shout about what’s happening in your department is a great way to celebrate student’s achievements as well as to raise the profile of your discipline and attract prospective students and parents. It is also a great public-facing body of evidence to point SLT and governors to. An e-magazine is another way to build your department’s digital profile. You can link to it via your social channels and website, and even produce a printed copy which can be left in any waiting areas or break-out spaces around the school for visitors to read. Editing and publishing the magazine would make a great project for sixth-formers who are looking for leadership opportunities. This example from The King's School, Worcester is published annually and published online as well as in print and distributed to city arts hubs. If you teach in an independent school which is part of the ISA, consider entering students for their annual art competition which we were proud to sponsor in 2018. The competition covers a wide range of art forms, from traditional 2D art to fashion and photography. Young Art is a competition for school students which is held at the Royal College of Art each year to raise funds for Cancer Research UK. Each student donates £2 to Cancer Research to enter. The more pictures that are entered per school, the more will be exhibited so this competition is a real opportunity to raise the profile of your department by representing your whole school. 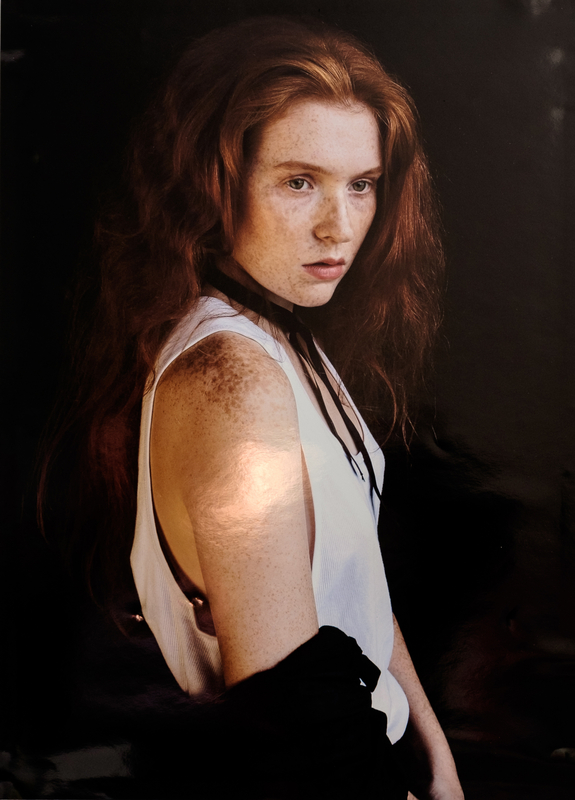 The National School Photography awards take place every year for budding photographers at all levels from primary to post 16. The prizes range from cameras and tripods to acrylic displays for your school, photography days and work experience placements with professional photographers. Alternatively, the Sony World Photography Awards are open to photographers aged 12-19 and involves submitting one image to convey the theme each year. The winner will have their work exhibited at Somerset House London. The top prize also includes flights to London and accommodation to attend the awards ceremony as well as Sony digital imaging equipment. All entrants who are shortlisted will have their work included in the digital exhibition at Somerset House. The creative industries are one of the UK’s fastest growing sectors, and are currently worth over £80 billion a year to the UK economy. With 1 in 11 jobs falling within the creative sector, we need more designers than we are currently producing. With Brexit on the horizon, there is a real need to increase the number of skilled British creatives in the job market, and this is where schools have a vital role to play. So how you can inspire the students of today to become the designers of tomorrow? Giving students ownership of a project to improve the school environment is a great way to give them hands-on experience of a design project as well as to create something visually stunning which in turn will help to raise the profile of the visual arts. If there are plans for a new building or extension, why not get students involved in the process? 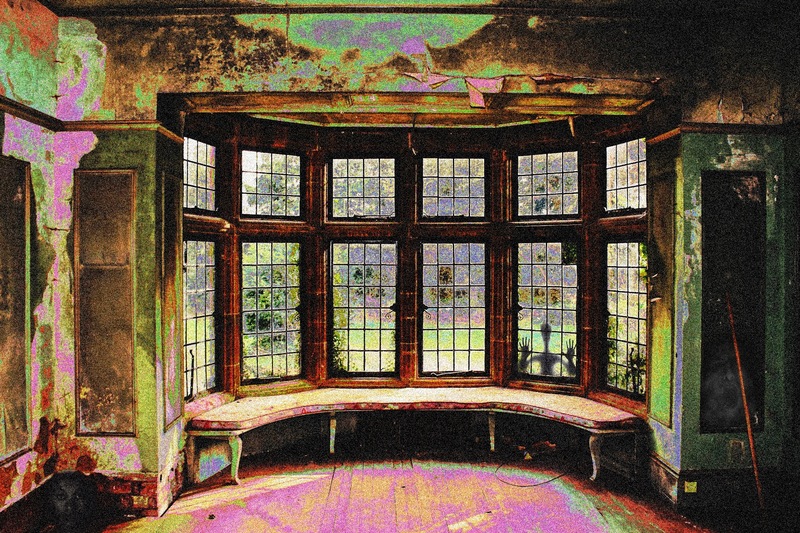 Or you could commission a group of talented design students to take an existing space and give it a make-over - such as the refectory, the reception area or the sixth form common room. Carefully selected trips can greatly enhance the perception of your department and instill ambition in your students. When planning for trips and visits, think of the brands you would like your department to be synonymous with, and the institutions that you would like to encourage your students to aspire to. Many places offer lectures and courses specially designed for school age students - encouraging your students to take up the opportunity for early study at some of the top institutions for the arts will help them to find the field that inspires and interests them the most. The V&A’s extensive schools and colleges programme is designed to give students opportunities to meet and work with industry professionals and to get practical advice and hands-on experience with professional artists and designers. 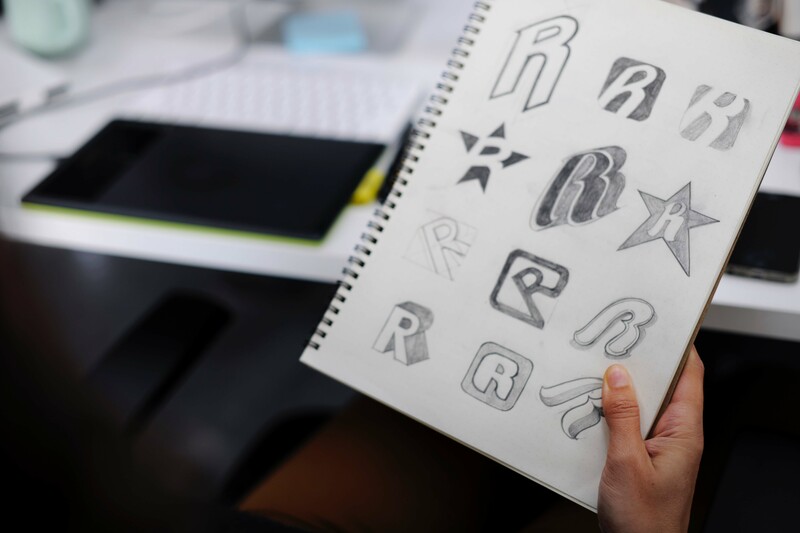 Their annual graphic design competition gives students the opportunity to work on a live graphic design brief. The museum also offers free resources for teachers looking for inspiration and workshops and twilight sessions for CPD. For the budding set designer, one of RADA’s theatre design courses could be the perfect fit. Applications are currently open for RADA’s 5 day courses in July 2019 for applicants aged 17 and above. The set-design course covers theatre space, creative interpretation in 2D and 3D and the visual languages available to the designer. 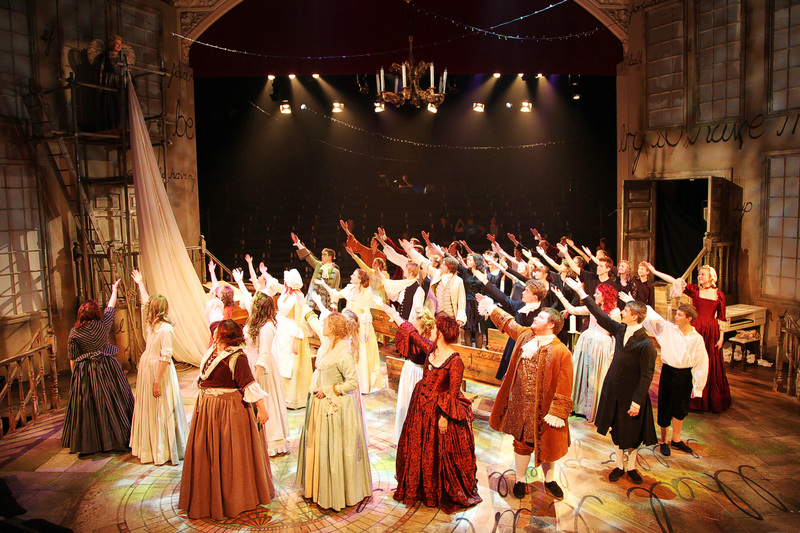 There are also courses in prop-design, lighting design and scenic art for the stage. LCF offers a wide range of opportunities for 14-18 year olds, both as residential summer school courses where students board for a full two weeks, and evening and weekend courses during term time. 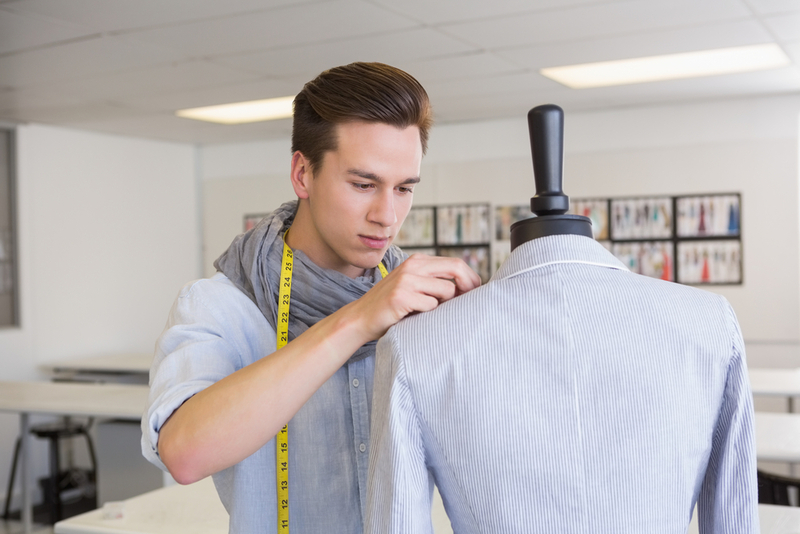 Courses available include fashion design and making, styling and media, fashion PR and marketing and fashion journalism and photography. Textiles opens up a wealth of opportunities for cross-curricular links and projects. Not every school has a textiles department, but if you are a textiles specialist there are so many exciting things you can do to raise the profile of your department, both through the curriculum and getting involved with whole-school events. Textiles opens up cross-curricular opportunities for Geography to educate students on the origins of the clothes we wear, the ethics of the fashion industry and the environmental impact of textile production and waste. Ethical clothes charity Traid runs a wide range of workshops and projects for schools on ethical design, up-cycling and sustainability in fashion. Teaching projects on these topics will also help your school to meet the ISS regulations for students’ personal, social, health and economic education. And if your school sends students out as part of the World Challenge initiative, then this could be an opportunity to tie in with textiles. If your school is considering a uniform redesign, this presents an obvious opportunity for a project or competition for textiles. Similarly, if there’s a performing arts production coming up, then pupils with a talent for textiles could get involved in costume or prop-making. Or if students are taking part in the Young Enterprise scheme, they may want to make clothes or garments to sell as part of this. Consider getting students involved in a charity sewing or knitting initiative - a great way to get some positive press for the visual arts and raise money for charity or raise awareness for a worthy cause. Innocent’s Big Knit initiative is a huge hit with teenagers. Each little hat knitted goes onto a bottle of Innocent smoothies, and for each bottle sold a 25p donation goes to Age Concern. You can find a huge range of resources including knitting patterns on the Big Knit website ranging from beginner to advanced level, and plenty of design ideas for inspiration. Making for Charity provides people with ideas, resources and project advice for people who wish to support charities through the production of craft items. Currently they are calling for people to sew syringe driver bags and personal effects bags for cancer patients. The bags are given to local hospices, palliative care homes and Macmillan cancer support. Loving Hands needs people to sew, knit and crochet for a range of charities and causes all over the world. They make everything from burial items for tiny babies who do not survive, to blankets, knee rugs and shoulder wraps for the elderly, fiddle mats and muffs for dementia sufferers, hats for sailors, warm clothing for the homeless and for children living in freezing conditions in places like Serbia, Ukraine and Moldova. This charity supports baby wards with crocheted octopuses for premature babies who need to feel more physically close to their parents. The tentacles act as a replacement for the umbilical cord and help babies to feel safe and calm. With these octopus tentacles in their hands, premature babies are less likely to pull at the life-saving tubes and cables attached to them. 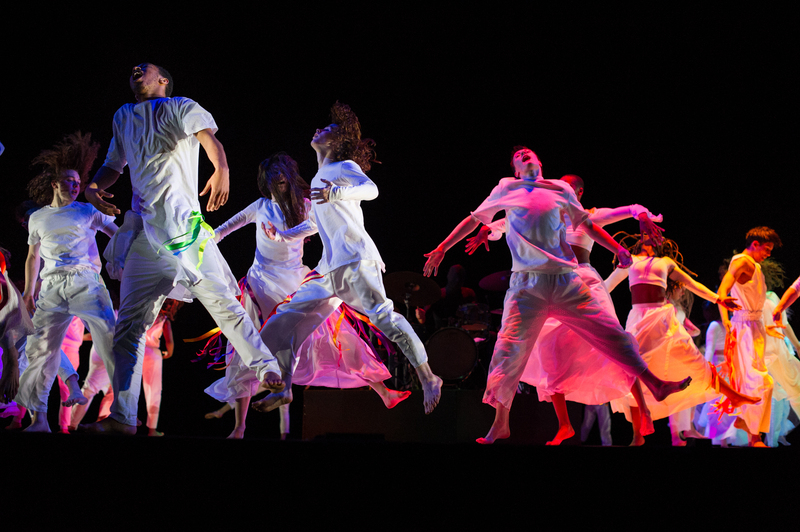 School productions present a host of opportunities for the visual arts to get noticed. Costume design and making, set design, prop-making, graphic design for promotional materials and programmes are all ways you can contribute to a production. Offering your support is a great way to showcase the talent you have nurtured, and to get recognition for the high standard of teaching in your department as well as to demonstrate the key role the visual arts have to play in the creative sector, inspiring younger students to take up visual arts subjects higher up the school. Why not hold an arts festival once a year? Join forces with the performing arts to take over the school for the week, with a set theme to tie it all together. Invite visiting artists and performers, hold student-led workshops for parents and staff to attend, and invite members of the local community to come along. Add a programme of events happening throughout the week - including a booking form - to the events section of your school’s website and promote each event via your school’s social media accounts. Or you could publish a calendar showing all the events running each term including performances and classes that are open to the local community - like this one from Harrow School. in the calendar and plan visual arts activities around them to celebrate the cultural diversity in your school. This will highlight the importance of the visual arts in all cultures, as well as creating an opportunity for students to be exposed to new art forms. There are many national days throughout the year - you’ll want to consider the ones which will resonate the most with your own school community. Awards ceremonies are the perfect platform for highlighting students’ achievements and promoting your subject area. Inviting a special guest to present the awards will add prestige and a sense of occasion to such events. Teaming up with subjects outside the visual and performing arts is another way to get your subject seen in a different light - for example if you use the awards to recognise students for leadership and enterprise, or contributions to the wider school community. Having a central theme to your exhibition will help to make it more memorable. You can really push the boat out in the way you curate students’ work and with the extra touches that surround the event such as music, catering and overall ambience. With this level of attention to detail, your exhibition will become something of an institution - an annual event which staff and students look forward to with anticipation. However don’t feel overwhelmed if this isn’t something you are able to facilitate straight away. Your theme could be as simple as GCSE or A Level/IB work, providing an opportunity to showcase this wider than in an exam room. Once you have decided on the theme for your exhibition, put out a call-to-artists inviting students to exhibit. Give a strict deadline for applications to the exhibit, and share your criteria for how work will be selected for the final exhibition, making the expected standard something for students to aspire to. This is not just an opportunity to showcase what students have done, but to push them to raise their game. You might want to run some workshops to give students dedicated time to work towards the pieces they plan to submit, or to learn any new techniques they need to acquire in order to make their vision a reality. You could bring specialists into school to demonstrate any particular skills or techniques that are outside your area of expertise - or use this as an opportunity to show just how multi-talented you are! Once the deadline has passed and students have submitted their work, you’ll need to select which pieces to exhibit. You could invite staff to help you to judge the submissions, or enlist the help of your artist in residence, if you have one. Now that you’ve selected the pieces that will be exhibited, you’ll need to ensure that the quality of the artwork is matched by the quality of the content that surrounds it. Assign the responsibility for curation of the event to the students who sit on the school arts council, or make it the collective responsibility of the students who are exhibiting. Creating the promotional materials for your exhibition is a project in itself - don’t miss this opportunity to nurture any students with an eye for design. It’s a good idea to assign students the task of writing a critique ahead of the exhibition so that you know you’ve got it covered - and so they experience the event through the eyes of an art critic rather than writing up a review retrospectively. You could also task students with photographing the exhibition and capturing some video footage so that the event is well documented from all angles. Your subject is bigger than your influence at school. Lever the power of your art form by ensuring opportunities to connect with the arts and culture in a real-world context are built into your curriculum or enrichment offer. With many galleries in the UK offering free entry, trips are a great way to add value to your offer and expose students to a world of art outside the classroom. Most school travel companies offer a wide range of trips abroad with a specific focus on the visual arts - creating an opportunity for students to visit some of the best galleries and museums in the world. To maximise the potential for a trip to raise the profile of your department, consider planning one which incorporates an event or includes an opportunity for students to meet industry professionals and experience something beyond simply visiting the galleries. One way to introduce the professional arts world is to invite an artist in residence to work in your school once a year. This is a great way to for aspiring young artists at your school to see an industry professional at work, and to create a sense of prestige to the visual arts department. Choosing an artist in residence who can offer a unique specialism or area of expertise is a great way to widen and enhance your offer, and to demonstrate the varied range of disciplines and careers in the visual arts space. Speaking of ‘real-life artists’, don’t forget that your school already has one in you. You are an artist in your own right, and, ultimately, the person best placed to demonstrate the value of the visual arts. 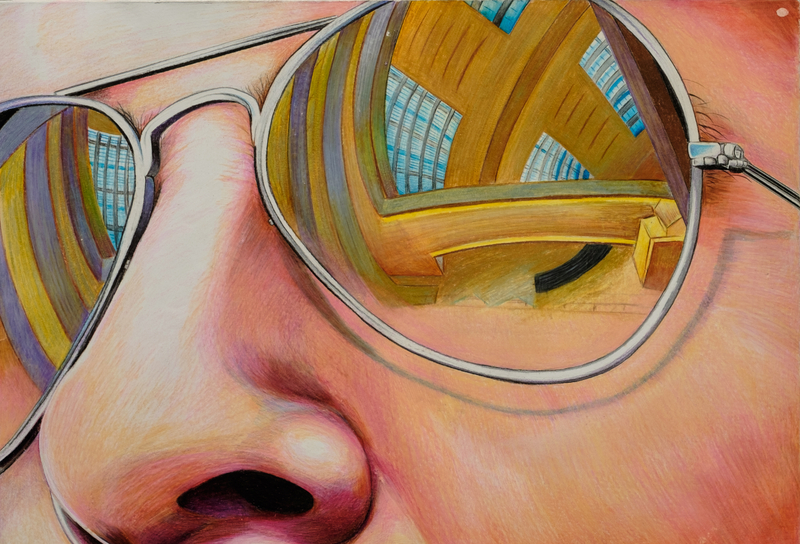 Art teachers essentially have two vocations - one as an educator, the other as an artist. So how can you get the recognition you deserve as an artist in your own right, and also use this to influence the perception of the visual arts in your school? Teaching is a demanding profession, and it can be a challenge to find time to do anything outside school during term-time - visiting a gallery might be the last thing you feel like doing when you’re in the thick of it all and you just want a break. But taking some time for yourself to attend an exhibition or to connect with some like-minded professionals could be just the tonic you need. Reconnecting with the wider arts world will give you inspiration and help you to keep your passion alive, and this in turn will shine through in your teaching and rub off on your students. Any vocation means continually developing and improving your skills, so you should look for training opportunities that will develop you as an artist as well as a teacher. Is there a particular discipline within the visual arts that you would like to develop? Or a series of lectures at the Royal Academy that you wish to attend? CPD courses don’t have to be designed specifically for teachers for your school to benefit - so consider casting your net a little wider to find courses that focus on your specialism. If you’re planning an exhibition, invite your colleagues and students to attend. This is the ultimate way to share your passion for your subject with the school community, and to show yourself in a different light as a professional artist, and not just an art teacher. Or why not some of your own work to your next school exhibition? Leading by example for your students in this way will set the bar high and give them something to aspire to, or maybe even appeal to their competitive nature: leave the name of the artist blank - could your students pass off your work as their own? If students aren’t promoting your subject, then who will? Students are potentially your best advocates - so use them! Think about how you are currently channeling the potential of students to promote the visual arts, and where there might be missed opportunities. Are there former students who have gone on to further study or successful careers in the visual arts? Why not invite them in to deliver a talk about their path to success in their chosen industries? You could also follow these alumni on social media and share their posts via your school’s Twitter and Instagram feeds. Or why not have a ‘wall of fame’ as a corridor display featuring former students with examples of their work then and now? If you don’t ask for student’s feedback, how will you know what they are enjoying, and therefore what you can do more of to maintain a healthy uptake in both exam entries and enrichment activities? Survey Monkey and Typeform are both easy platforms to use for this purpose - create one survey a term to find out what students love about your subject - or if there is anything putting them off. You can then use the best sound-bites from these surveys in any promotional materials - such as your schools’ prospectus. You’ll get more engagement and buy-in from students if they have a say in what happens with the visual arts at your school, and you’ll get more done into the bargain if you delegate an area of responsibility to them. If you don’t already have an arts council in your school, perhaps you could set one up in collaboration with your colleagues in the performing arts, with a student representative from each house or year group. The Arts Council committee could meet once a term to review how the Arts are being represented across the school, plan events and discuss opportunities for enriching the Arts offer in your school. Make sure to check in with SLT and the governors on this as well, as these programmes are often most valuable and recognised when their recommendations can feed straight to the governing body, and hopefully the strategic plan for the school. 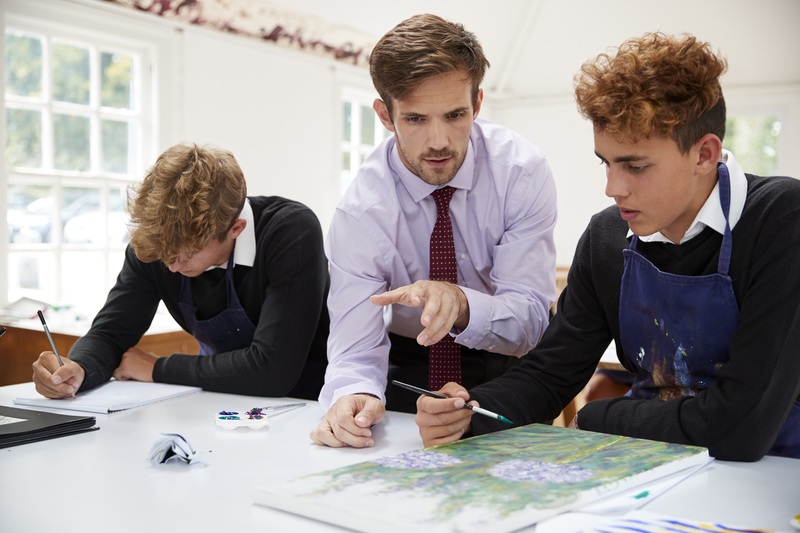 Top-grades, a competitive enrichment offer and a great shop-window to promote your visual arts provision are three core ways you can stand out as a leading department in your school, and even as a beacon to other schools locally and nationally. If you’re running workshops in school, why not invite students from local state schools to join? Or you could organise a session for local primary school children around a particular art-form or technique, lead by your students. Getting a high percentage of top grades is your bread and butter when it comes to showing your value on a whole-school level, no matter which subject you teach. If students taking visual arts subjects at GCSE, A Level and via the IB are consistently achieving high grades then of course you’ll want to shout about this. 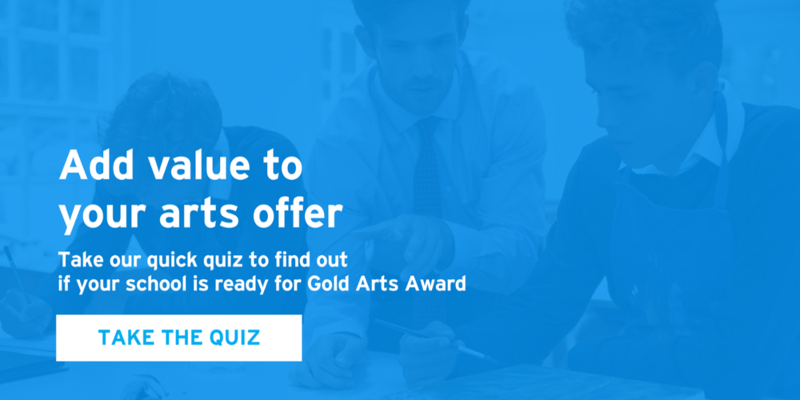 But it isn’t only GCSE and A Level qualifications that can contribute - Gold Arts Award is a Level 3 qualification on the Regulated Qualifications Framework (equivalent to Higher Sports Leadership, or a Distinction in Music Graded Examinations Grade 7). This is especially useful to students applying to top universities who want to make their application stand out with qualifications they have already gained in addition to their predicted grades. The great news here is that many of the enrichment activities that students are already undertaking in the visual and performing arts can contribute towards their Gold Arts Award, making it a brilliant way to add value. 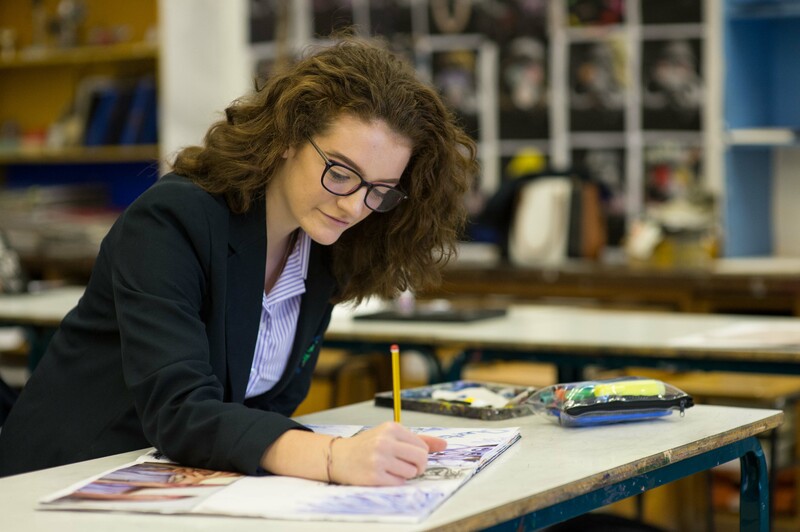 A huge choice of extra-curricular activities can be offered through the visual arts, catering for a wide range of interests - and this is a fantastic opportunity to show how versatile your subject is. But the onus shouldn’t be on you and the teachers in your department to deliver everything yourselves - use your art technicians. And don’t forget your sixth form students - if they are working towards an accredited qualification such as Gold Arts Award, then leading enrichment activities for younger pupils is the perfect opportunity for them to develop their arts leadership skills which this level demands. Enrichment doesn’t have to be exclusively for students - holding some after school workshops for staff and parents is another way you can shine a light on the visual arts. You could even open up booking slots for these sessions to the local community with a simple eventbrite booking form on your website, bringing an additional revenue stream to your school. A picture is worth a thousand words. Your visual arts department has the potential to be your school’s best salesperson when it comes to attracting prospective students and parents, because it can be seen! If photography is part of your offer, why not make photographs for the school’s website, blog or prospectus a project for your students to work on? Get it right, and the visual arts will be what makes the first and most lasting impression on visitors to the school, be they parents, students or ISI inspectors. Student artwork: ISA Art Competition finalists 2018. With thanks to the Independent Schools Association, schools and finalists for their kind permission to reproduce the artwork.